Volume Duration defines the total amount of traded volume desired to achieve the total goal quantity. You may set Volume Duration parameters as either a desired volume or disclosed quantity. Interval (the default) specifies the number or percentage of contracts that must trade to trigger a slice to enter the market. The TT system calculates the child order portions needed to achieve the total goal quantity for the total volume. 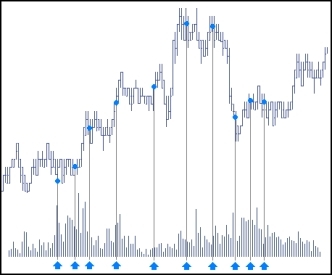 The following screen shot illustrates a Volume Duration order with a goal quantity of 150, an interval of 100, and a duration of 1000 contracts. This means that there must be 100 contracts traded between each disclosed order portion for a traded volume of 1000 contracts. The Preview Grid displays the proposed volume interval and child order portions needed to achieve the total goal quantity. Note: X_TRADER automatically corrects parameter fields that contain invalid values. When this occurs, the child orders are recalculated and display with a yellow background in the Preview Grid. Disclose sets the disclosed quantity or percentage of total goal quantity viewable to the market and total volume. The TT system calculates the volume interval between each child order portion for the total volume. 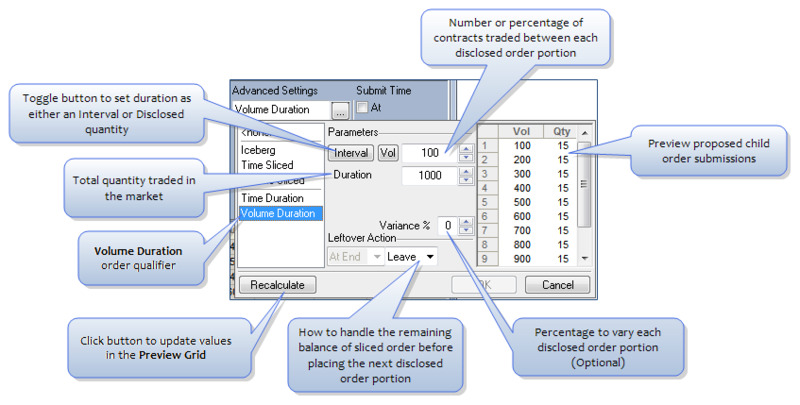 The following screen shot illustrates a Volume Duration order with a goal quantity of 150, a disclosed quantity of five, and a duration of 1000 contracts. The Preview Grid displays the proposed volume interval and child order portions needed to achieve the total goal quantity. Variance percentage and Leftover action parameters are available when Volume Duration is selected in the Advanced Settings section of the Order Pane. Use the Price Mode section to set how to price each child order portion that will be submitted to the market. Click the Advanced Settings drop-down and select Volume Duration. Set the Interval or Disclosed order portion. Interval is either a percentage or a fixed number of contracts that must trade to trigger a slice to enter the market. Disclosed is either a fixed number of contracts or a percentage of total goal quantity viewable to the market. Note: Click the Interval button to toggle between Interval and Disclose. Note: Click the % button to toggle between Interval % and Vol or Disclose Qty and %. Set the Duration to achieve the goal quantity. This is the total quantity traded in the market. Set a Variance % if you would like to vary each disclosed order portion. This is how to handle the remaining balance of the resting sliced portion before disclosing the next order portion. Preview the proposed child order portions in the Preview Grid. Click OK once you have configured the sliced order settings. Note: Left-clicking outside the Advanced Settings dialog box also saves your configured settings. Click Buy or Sell once you have entered the desired order parameters to submit the sliced order. 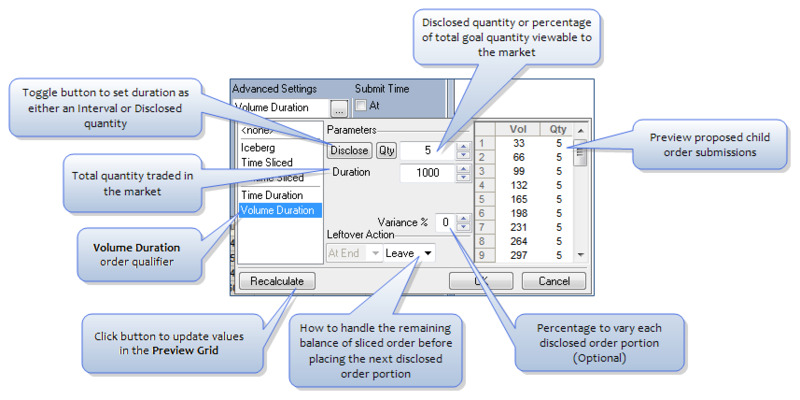 From MD Trader, select the Volume Duration order configuration. Select the Volume Duration configuration in the Order Type drop-down list. Click the Buy or Sell column at the price level where you would like to submit the sliced order. This displays the working and undisclosed quantity in the Working Orders column adjacent to the price..